PHOENIX - UPDATE: The stop work order has been pulled, and True North Companies can now continue as planned. Rose + Moser + Allyn Public & Online Relations says True North intends to effort on-site and off-site preservation elements. It also says the fence was installed around portions of the Chinese Cultural Center for "safety reasons while tenant improvements and the other work is undertaken." The company says this is not an indication of "pending or future demolition of buildings." PHOENIX (3TV/CBS 5) - The Phoenix City Council voted Tuesday night to move forward with a historic preservation study of the Chinese Cultural Center. PHOENIX (3TV/CBS 5) - One of the major Chinese businesses of the center is moving.After hearing hours of pleas from people about saving the Chinese Cultural Center, the Phoenix City Council gave them a victory on Tuesday evening. PHOENIX – Members of the Chinese community in the Valley say they were caught off guard by the sudden sale of the property where their cultural center is located. PHOENIX (3TV/CBS 5) - The Chinese Cultural Center in Phoenix closed the doors of its iconic market this weekend because of new ownership. But members of the community say they will fight to keep the identity of the building. PHOENIX - The Chinese Cultural Center in Phoenix has a new owner who wants to modernize it, while supporters want to keep its Asian heritage. PHOENIX (KSAZ) - There were more protests at the Chinese Cultural Center on Sunday. Demonstrators say they believe the center is about to be sold. The protesters believe demolition on the building is already underway and they are hoping to stop the process and preserve history. 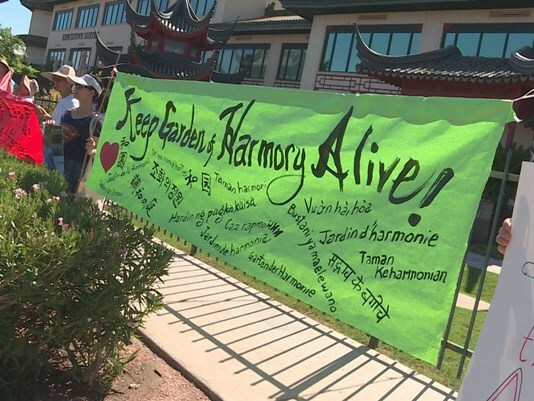 PHOENIX (3TV/CBS 5) - Dozens of demonstrators stood outside in the heat in an effort they said to save the Phoenix Chinese Cultural Center from being destroyed.